From its earliest days in the High Streets of Britain and Ireland F.W. Woolworth was a favourite destination for children. Kids found that their pocket money went much further at Woolies than in rival stores. 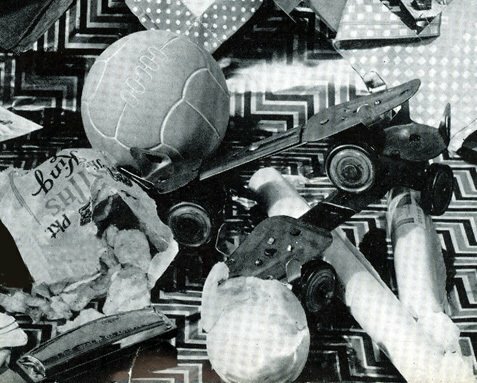 This page explores some of the threepenny and sixpenny toys that our great grandparents craved before World War I and through into the 1920s. Most of the items are simple, but not so very different from the pocket money toys sold in pound shops and supermarkets today. 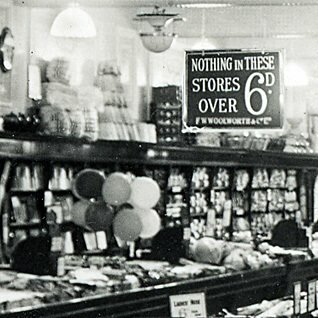 When our great great grandparents shopped at Woolworth's before the Great War of 1914-1918, the store chain was already thirty years old. 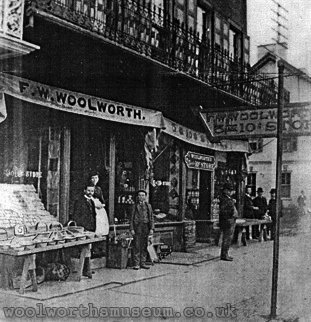 Frank Woolworth opened his first branch in Lancaster, Pennsylvania in the United States of America in 1879. One of the first items ever sold was a toy dustpan. The same day he also sold several baseballs and police whistles! What set Woolworth's apart from other stores is that all of their items were simply made and very cheap. Every toy sold on that first day cost 5¢ or less. This was less than one penny then, or 35p at today's prices. By the time Woolworth UK opened in 1909, its Founder had already built a big toy range. Frank travelled the world looking for good designs which would allow him to make luxury toys more cheaply so that everyone could enjoy them. Nearly everything he sold in America was made Europe, with metal and glass toys from England and dolls and fancy items from Germany and Russia. This gave the British Woolies a head start. A century ago families had less money. Many felt toys were a luxury that they couldn't afford. So, rather than displaying them all the year round, Woolworth's would only put them on sale at certain times of year. The same counters were used for gardening and seeds in the Spring and Autumn, with Toys at Easter, during the Summer holidays and, of course, before Christmas. Whenever Toys went back on sale, the displays were highlighted by a big bunch of balloons tied to the till and bold window displays. Some of the items were just one old penny (half of a modern penny), while the most expensive items were sixpence, (2½p), which was much less toy shops and department stores. The toys were very simple. A favourite item was the glass marble, which came in many sizes and colours. 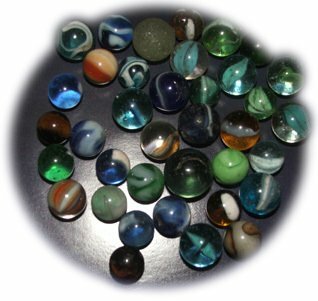 In 1909 and 1910 children could choose four marbles for one old penny (½p), or a string bag of thirty for sixpence (2½p). There was no television and no radio. Families often played games in the parlour (living room) during the long winter evenings. Woolworth's were there to help. There were things to play together, like darts and simple table tennis, or board games for family fun. The favourites included 'Lotto', a type of bingo, ludo, draughts, snakes and ladders and tiddlywinks. Most items were made of paper or card, with tiny dice made of wood or 'composition' (a kind of cardboard). 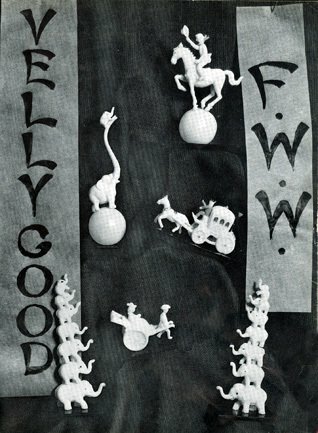 Posh toy shop used wooden tokens or counters for tiddlywinks and players' pieces, while Woolworth used cardboard to keep the price down. New games followed the latest crazes, like Speedway, a motorcycle racing game in the 1920s. Some shoppers weren't actually buying for children at all. The range was designed to appeal to all ages. Playing cards and crib (cribbage) boards, pads to keep score and counters to use as tokens for gambling games, were all popular with adults. People often bought toys to take to the canteen at work. 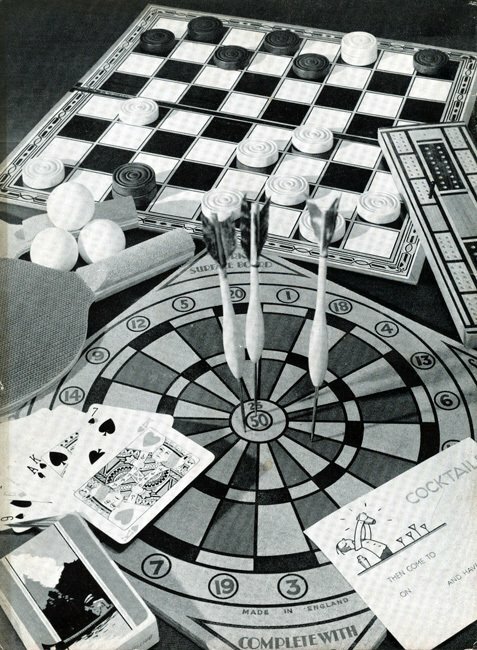 Combined chess and draught boards, supplied with a cardboard box of wooden pieces, and cardboard dartboards sold complete with three darts with metal tips and cardboard flights were best sellers. Many a Works Ping-Pong Club was equipped with bats and balls from the local Woolies. The items were so cheap that when they wore out they could be replaced for sixpence. Building a 'layout' was a popular pastime in both Britain and America. Kids made their own imaginary worlds. Some chose farms or country scenes, while others preferred soldiers and battlefields. The picture above shows the American ten cent selection in 1914. The picture below shows the British 1930s equivalent. The toys were made of lead. Britain's exported these English-made figures right around the world. Woolworth secured any that had minor manufacturing defects, which were known as 'seconds', which they sold at a fraction of the regular price. You can spot them today at collectors' fairs because they have the letter "S" (for seconds) or "W" (for Woolworth) etched on the base. 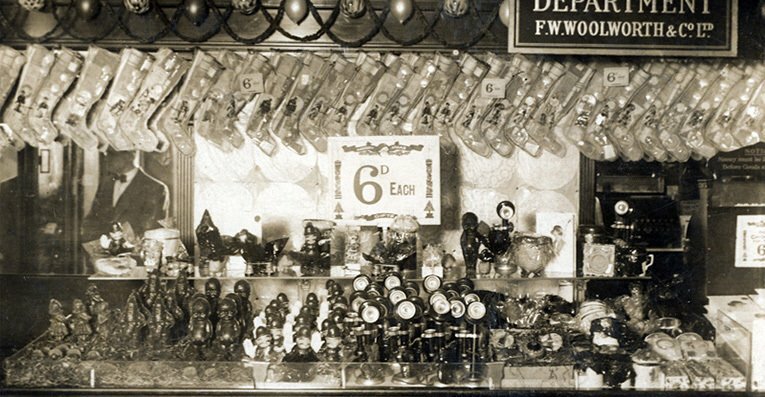 This display above, which was photographed in the Woolworth's in Rushey Green, Catford, South London in 1936, includes more than a thousand toys from Britain's. Cattle and tropical animals graze on the right hand side along with lead soldiers, cannons and the horsemen of the Royal Horse Artillery. The signs say 'All British Lead Toys'. 1930s favourite also included musical instruments. These special buys offered decent 'tin whistle flutes', the Woolworth name for recorders, and 'harmonicas' (mouth organs) for sixpence during half term. 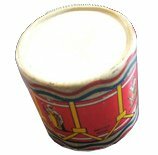 As a bonus miniature drums from Happynak Toys had a 7.5cm diameter and a secret hoard of pic'n'mix toffees hidden inside. Soft toys and dolls were also very simple. They were mass-produced using cheap materials. 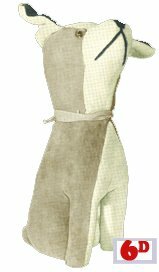 Cuddly animals were generally filled with straw, while dolls were made from 'composition', a blend of cardboard and papier maché . Others, like the tiny two inch (5cm) dolls shown, were made of rubber. Their clothes were sewn from scrap lace from the cutting room floor. To add a little spice to the offer, Buyers sought 'specials', scooping up out surplus production from fancy factories in Britain and Europe. These high quality lines were sold at jaw-drop prices and were rationed to stores, with each typically getting six of each. They were placed on sale first thing on Saturday morning in the hope that the word would spread around town and attract extra shoppers throughout the day. 20s and 30s kids loved Woolies' Scrap Books and Stamp Albums. Collecting was easy and cheap. 'W University' loose leaf binders were sixpence, (2½p at the time or £2.11 today). Inserts were sold separately. The options included stamp sheets, coin inserts, cartridge paper for sketches and black card for scrapbooks as well as standard, white ruled file paper. Girls cut out pictures of their favourite movie stars from glossy magazines, or opted for prepared sheets for a penny each from Woolies. A million girls snipped the popular Shirley Temple sheet. 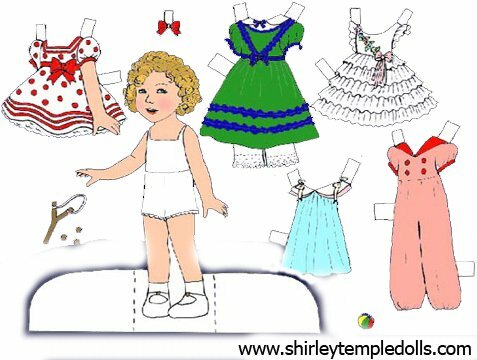 We didn't have one in our collection, but found some great examples in a lovely site at http://www.shirleytempledolls.com. The luckiest girls got their dads to cut a piece of plywood to a Shirley shape, before affixing her face and dressing her differently each day! 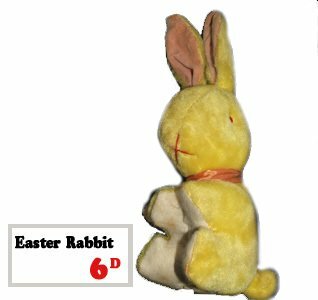 Easter brought an invasion of chicks and rabbits, some carrying wicker baskets filled with chocolate coins wrapped in shiny gold paper. 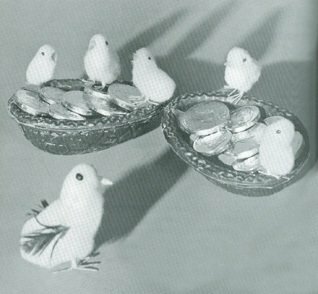 The illustrations show two pairs of three chicks, two chocolate coin sets and two baskets. The total price for everything shown was three shillings (15p). The illustration shows the 1936 "Woolworth recommends..." range. It suggests items for a Christmas Stocking. As well as a bag of toffees, there's a small leather-look rubber football, a pair of roller-skates which were sold as a left and a right foot, each for sixpence, and a mouth organ. The wrapping paper and stocking itself were extra. The items shown total back two shillings and ninepence (13¼p or about £9 at today's prices. You can find more details of the cunning ways that Woolworth kept prices under sixpence, and see the number one 'Fancy Goods Item' that many parents gave as a toy, the Woolworths Sixpenny Camera, in our Keeping Prices under Sixpence feature. Chinese-made ceramic animal ornaments were popular novelties. These included a dinosaur, a 'Cinderella' coach and a performing elephant. 1937's hit toy was the Palm Lounge Set. 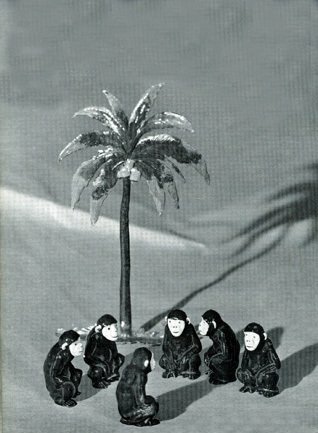 Those buying six sixpenny bakelite apes got a free palm tree to shade them from the sun.